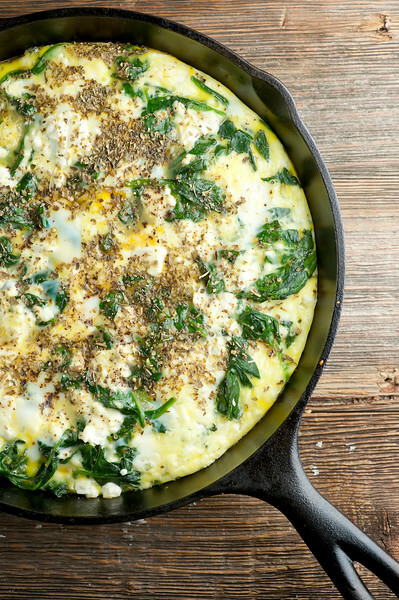 This easy recipe for spinach feta oven frittata cooks up perfectly in your favorite cast iron skillet! Eggs and veggies, it’s what’s for dinner. 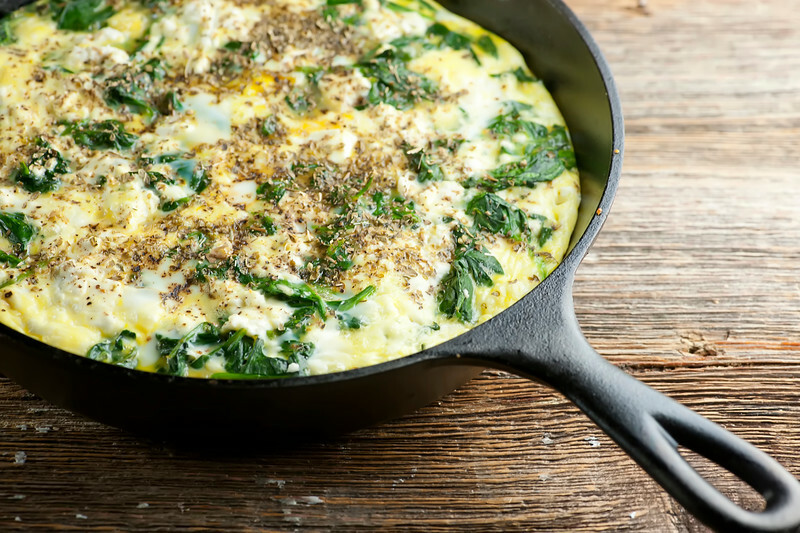 This recipe for spinach feta oven frittata came about from my love affair with my cast iron skillet. This is a relatively new love affair, because I haven’t had my cast iron skillet for all that long, so I am in the midst of doing all kinds of experimentation on the different things that come out deliciously in it, which so far is pretty much everything. From casseroles to cobblers, and from bacon to all kinds of eggs, this skillet is my new favorite kitchen buddy, and as your grandma could probably tell you, the more you use it, the more seasoned it gets, and the better it cooks. Obviously because of the whole cast iron thing, it can go from stovetop to oven, and it delivers a steady, serious heat that is perfect for things like frittatas full of cheese and spinach deliciousness. So grab your own cast iron skillet (or whatever oven-safe skillet you have – that will work too) and let’s make it! You start by sautéing up some baby spinach, which I particularly love because it usually comes pre-washed and with no chopping needed because of its cute baby spinach size leaves. Once it is nice and wilted, transfer it to your oven-safe skillet, pour some beaten eggs on top, sprinkle on some crumbled feta cheese, shake on a little salt and pepper and pop it in the oven. About 30 minutes later you have a skillet full of THIS. I like to scatter a generous amount of oregano on top because it goes so perfectly with the feta cheese flavor. Let it cool for about five minutes, then cut it up into wedges and serve! Almost too good and easy to be true, right? BUT IT IS. Heat olive oil in a large skillet over medium high heat. Saute spinach until wilted, and then transfer to a 10 inch oven-safe skillet (I use my cast iron skillet). Beat eggs until frothy and pour over spinach. Crumble feta and sprinkle over eggs. Season with a pinch of salt and a grinding of pepper. Bake for 30 minutes or until eggs are set. Sprinkle liberally with ground oregano. Cool slightly, cut into wedges and serve. I have the same feelings for my cast iron skillet, I have only for about 1 year now, but I use it all the time. This spinach frittata is a great opportunity to use it again, so simple but so tasty, I am sure, spinach and feta make a great combo! Glad for this post Kate! I have gotten off the frittata wagon (there is one right?!) for some reason for supper! I agree .. So simple yet beautiful. I might toss some red bell pepper with the spinach as I am being well supplied by a friend. It has seen eggs, chicken, chicken fried steak, etc. as she was a southern gal. You really can’t beat it. I have cast iron pan, but I don’t know why I don’t use that often but that needs to be changed now. Spinach and feta is a great combo, so I am gonna make this delicious looking frittata very soon. I actually just made a similar frittata a few weeks ago, and I’ve been hooked on the flavors! Spinach and feta is one of my favorite combos, and I love eating it for breakfast! Looks delicious, Kate! Spinach and feta is one of my favorite combos. And cast-iron skillets are the best. This looks amazing! Kate, I am loving this love affair that you’re having with your cast iron. Don’t worry, I won’t tell the Southern Husband. ;) This frittata looks just perfect! Can’t wait to see what you cook up next. Have a great week, my friend! i actually have never baked one in my cast-iron skillet, but that’s definitely worth a go! Yum! Love the spinach and feta combo. Have to have meat with our meals, though, so will throw some cooked sausage in there for mine. Have you tried making pizza yet in your cast iron skillet? So, so very good! You can use the cast iron skillet on your grill so no need to crank the oven up in the house! I tried this recipe out last week! So tasty, great breakfast meal! Could you sauté the spinach in the cast iron skillet? This was extremely easy but still a great way to use my cast iron as well as get some veg & protein in with my cheese habit. I was worried about getting the egg mixture out of my pan but it was 10x better than when I’ve tried to make scrambled eggs. Pop some extra veg & seasoning in as you like–there’s room for the goodness!